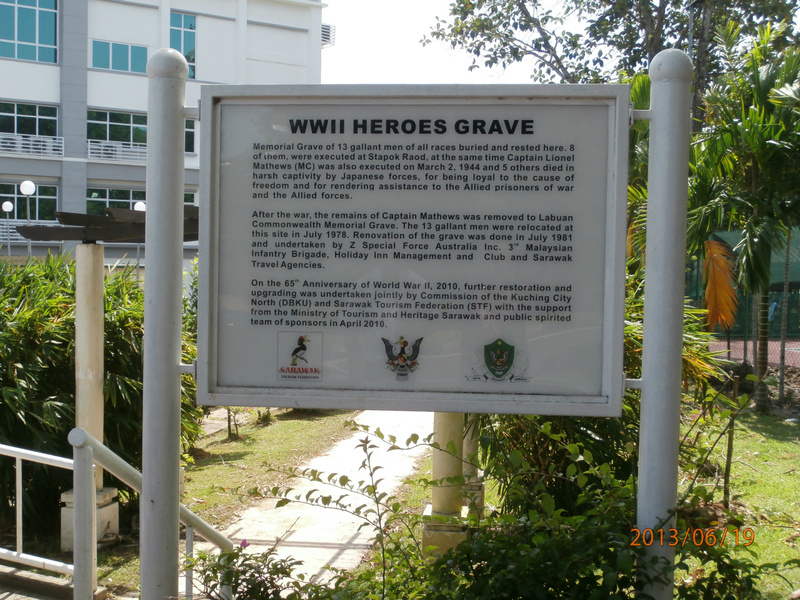 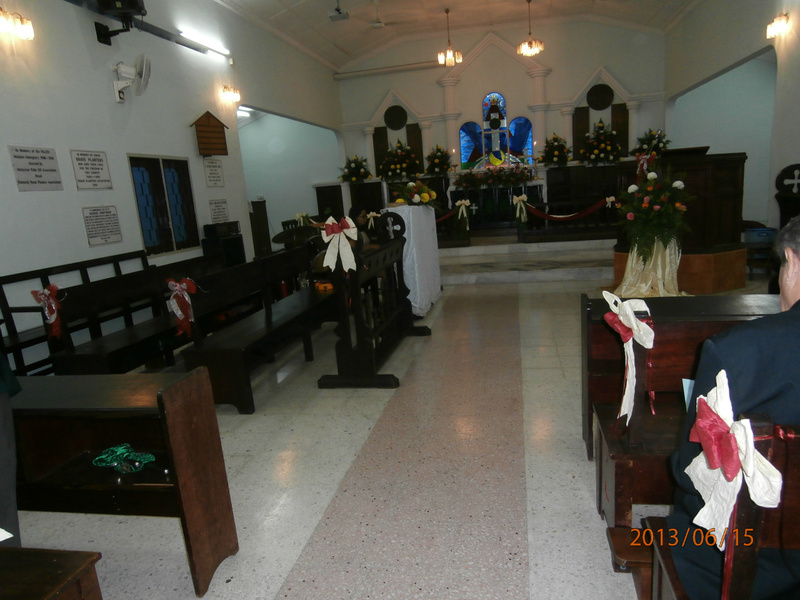 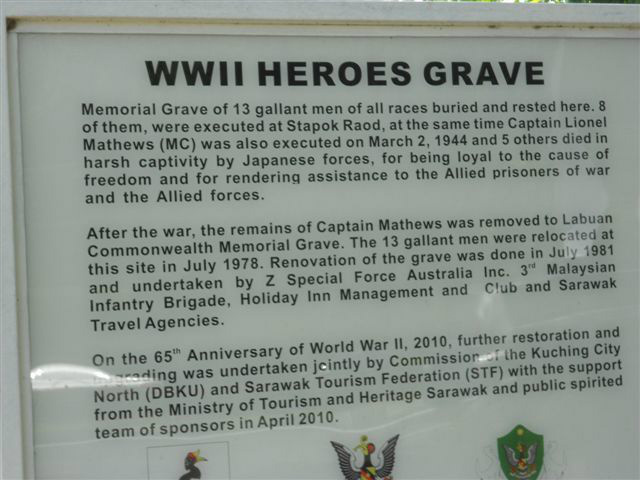 The grave of the 13 Sandakan locals who assisted Capt Matthews build a radio for the POW camp at Sandakan. 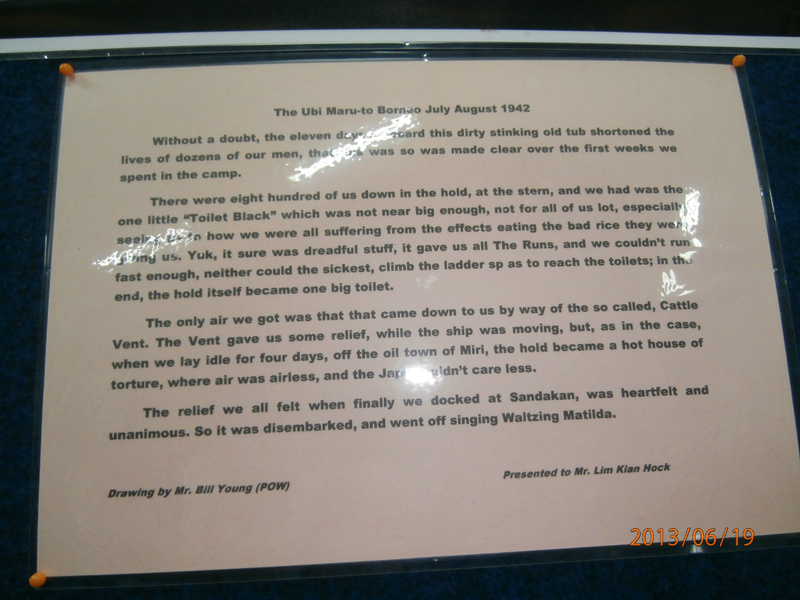 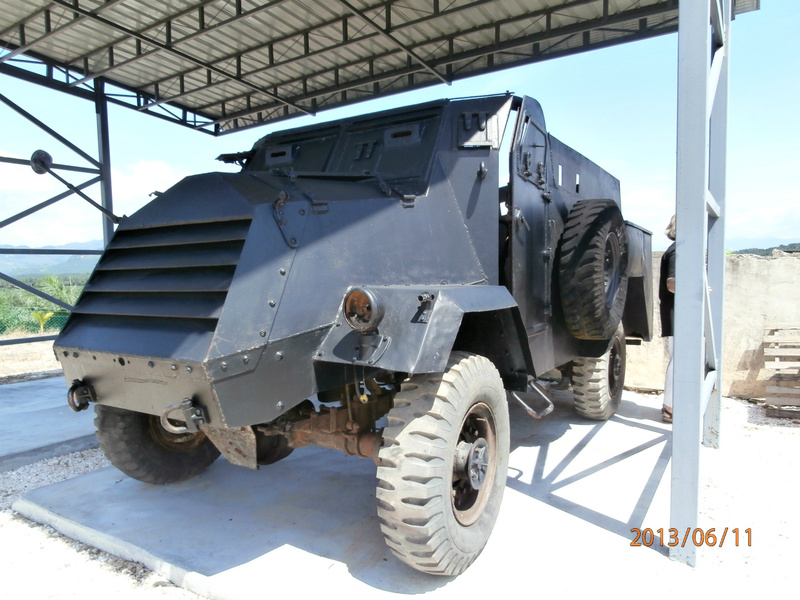 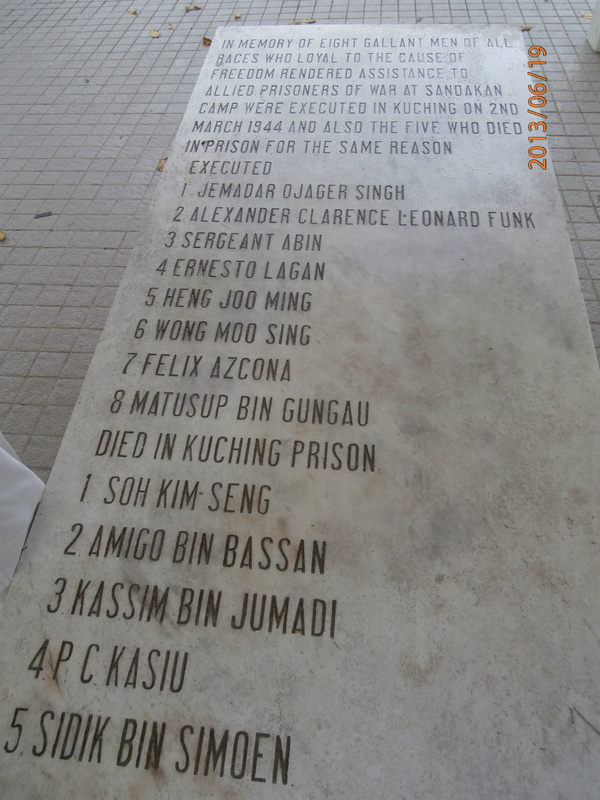 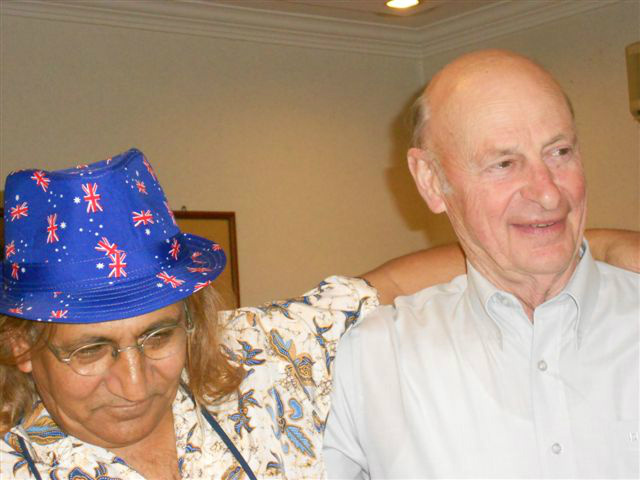 They were brought to Kuching for trial. 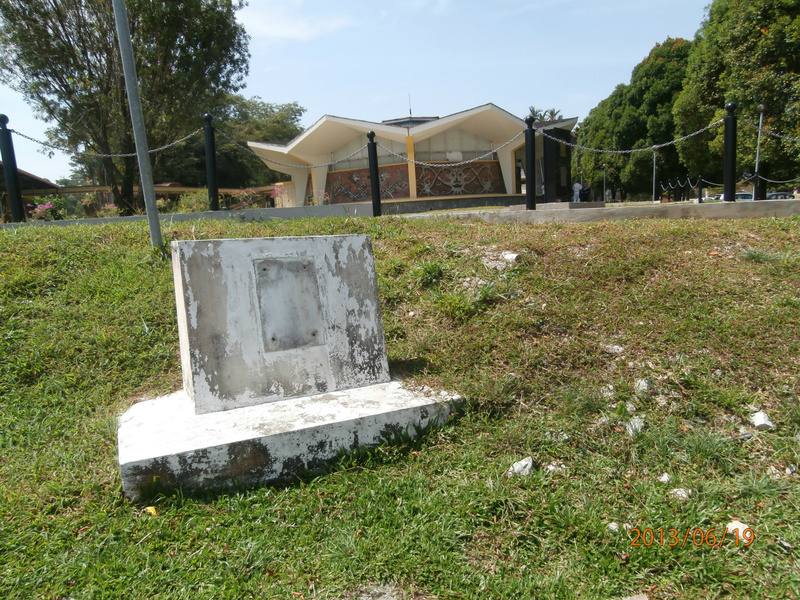 This is the Malaysian Army Monument situated adjacently to the WW2 Heros Grave in Kuching. 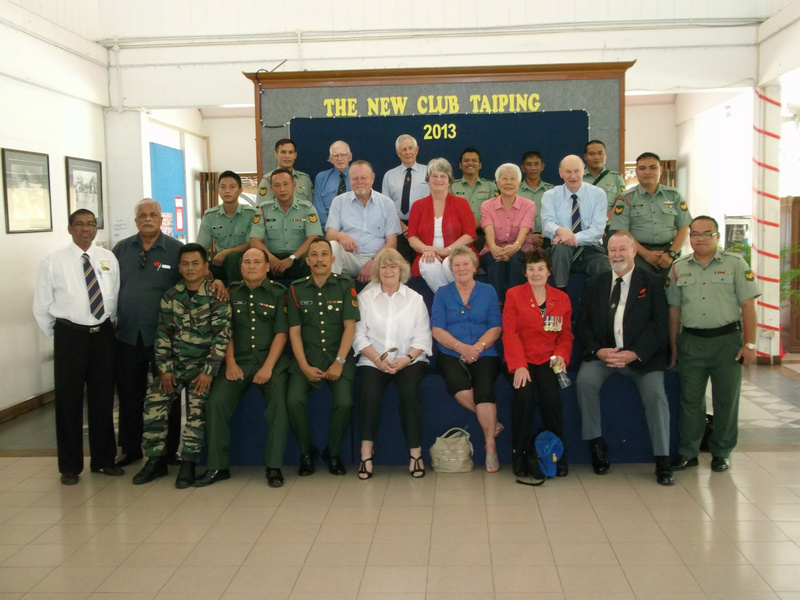 Group Photo at the New Club Taiping....not all NMBVAA members are present. 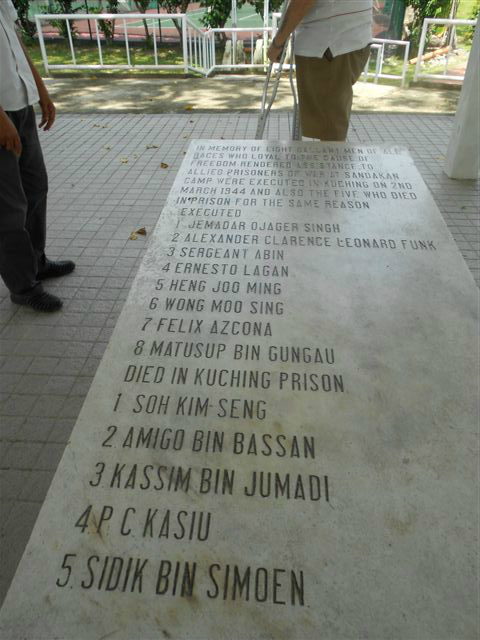 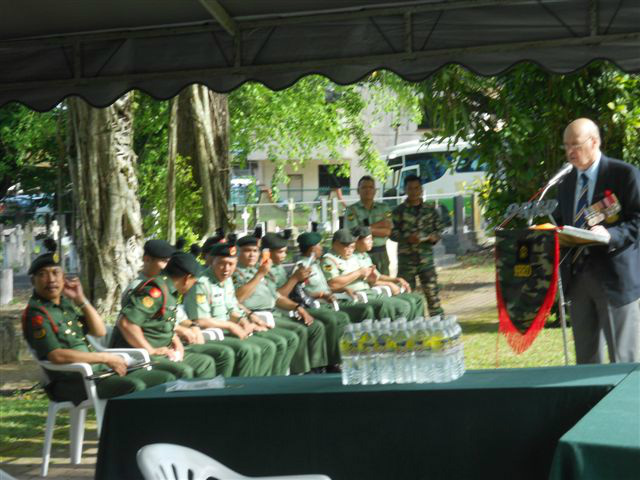 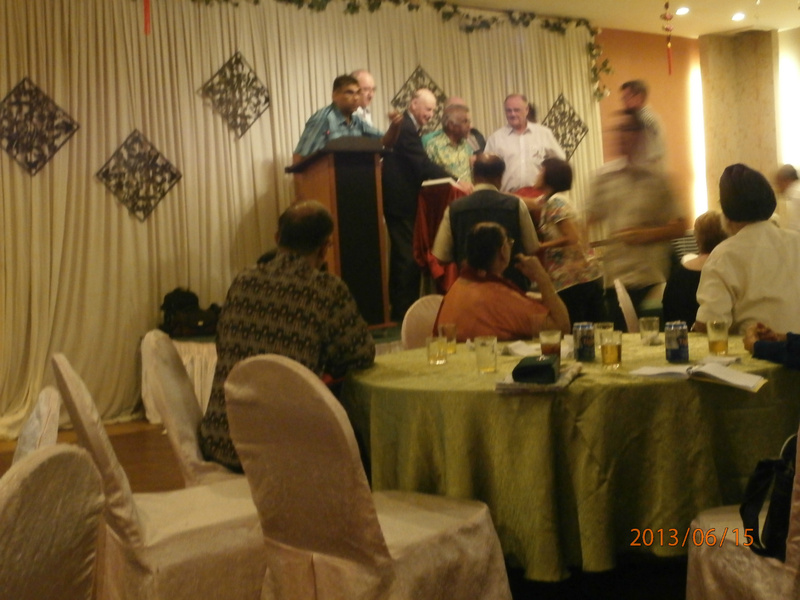 Troops Night, sponsored by Dato Simon Chan, 3rd from Right. 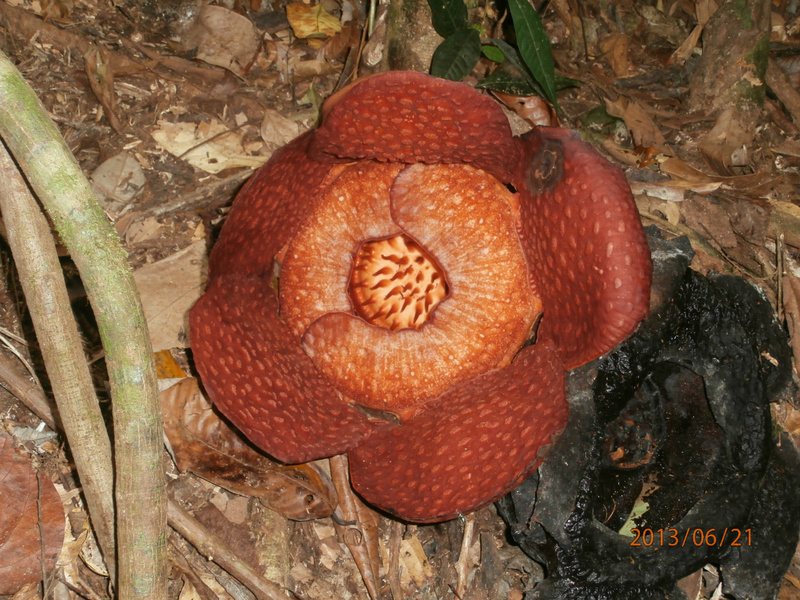 Raffleasia flower, said to be the largest flower in the world. 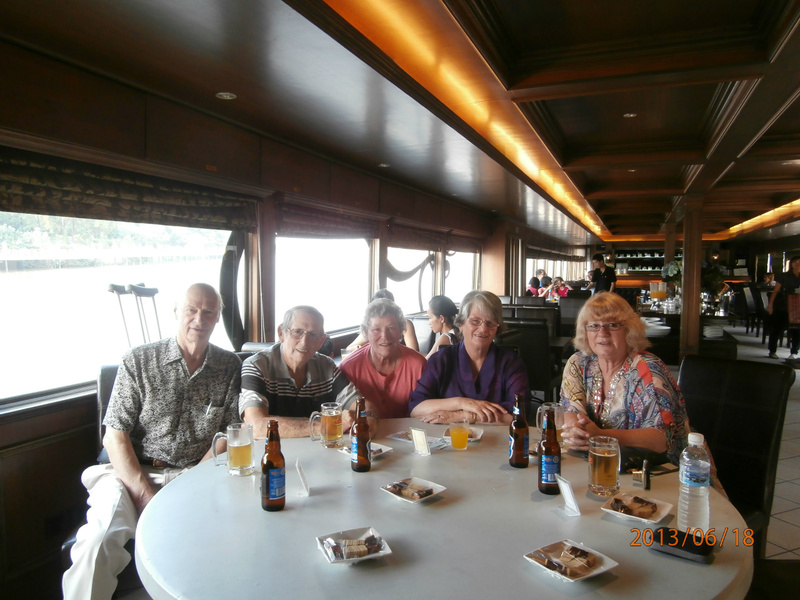 This one pictured in the rainforest 100 ks from Kuching. 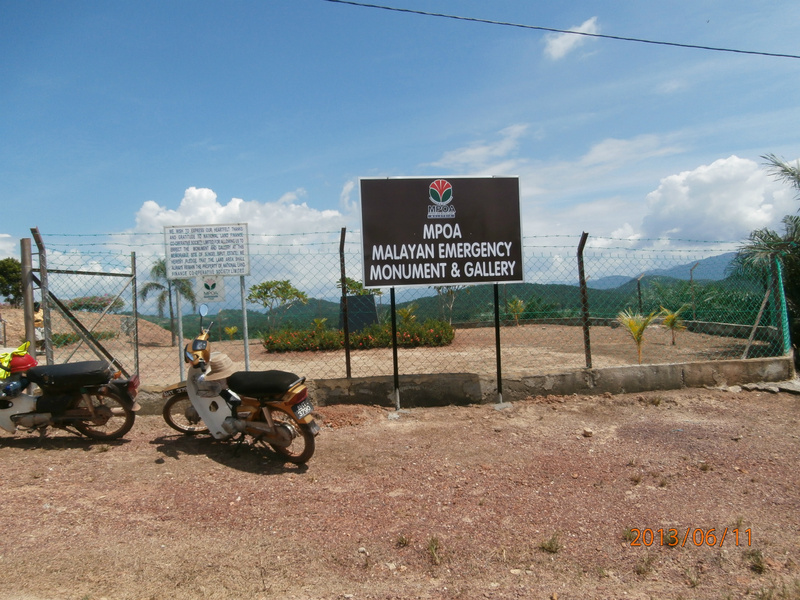 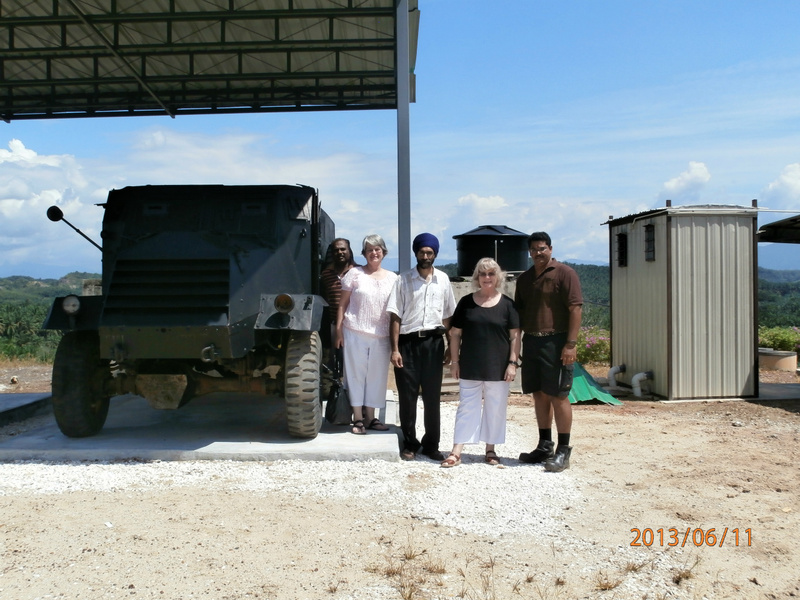 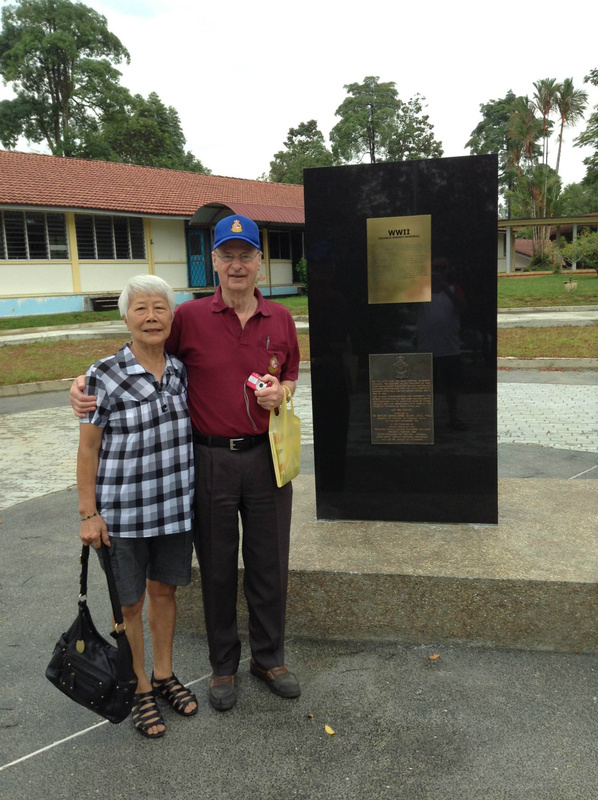 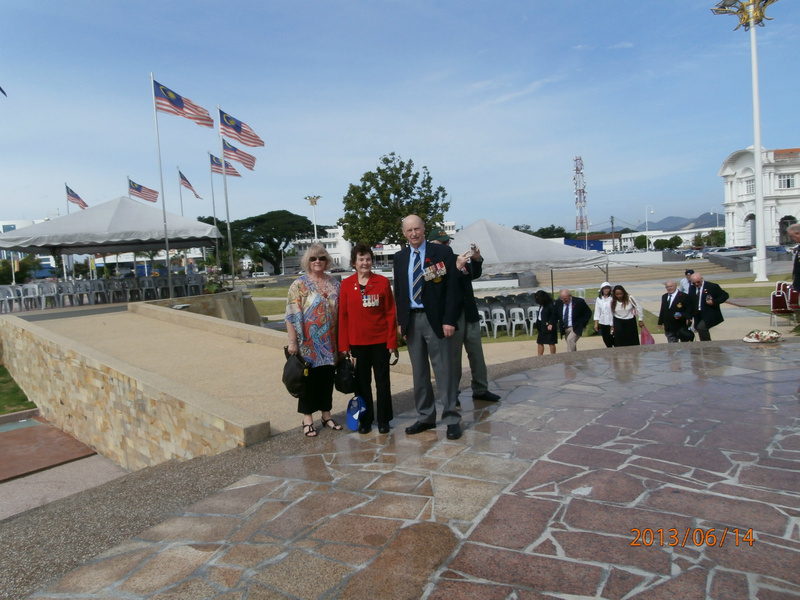 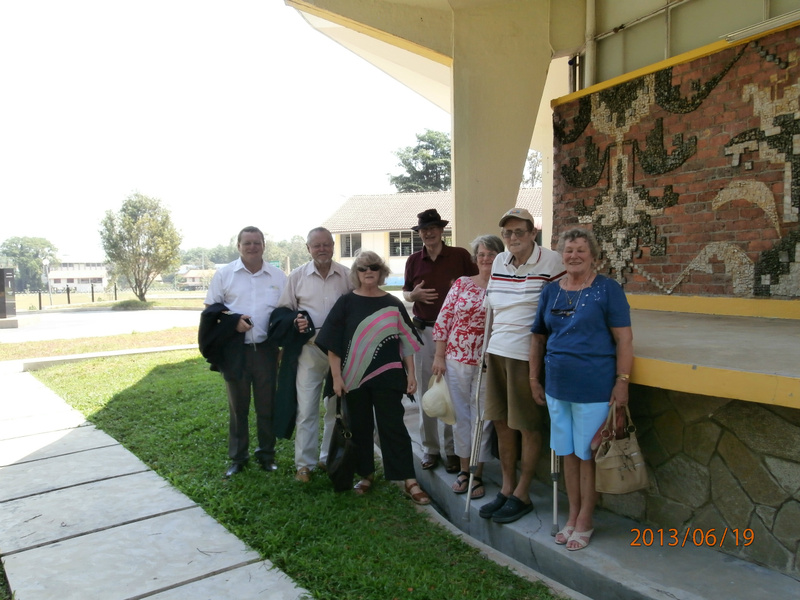 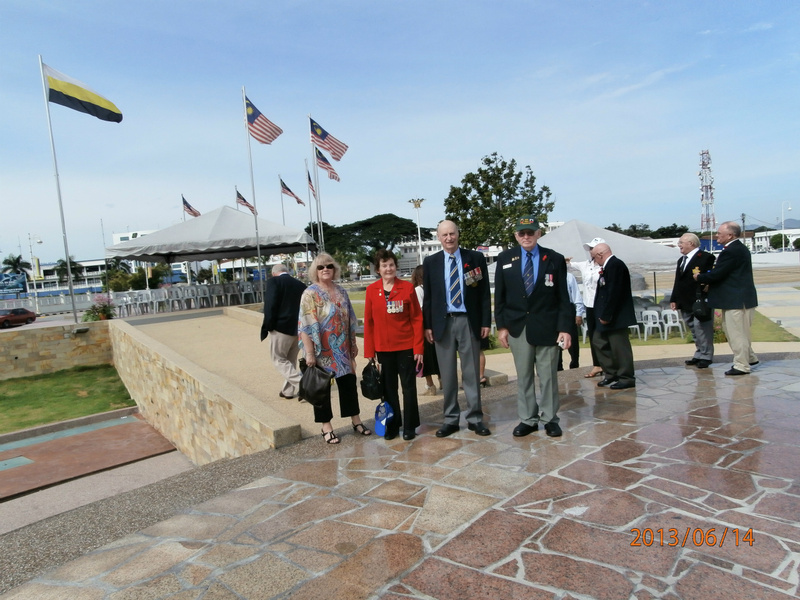 Helen Field with Ken McNeill at theBatu Lintang POW Monument. 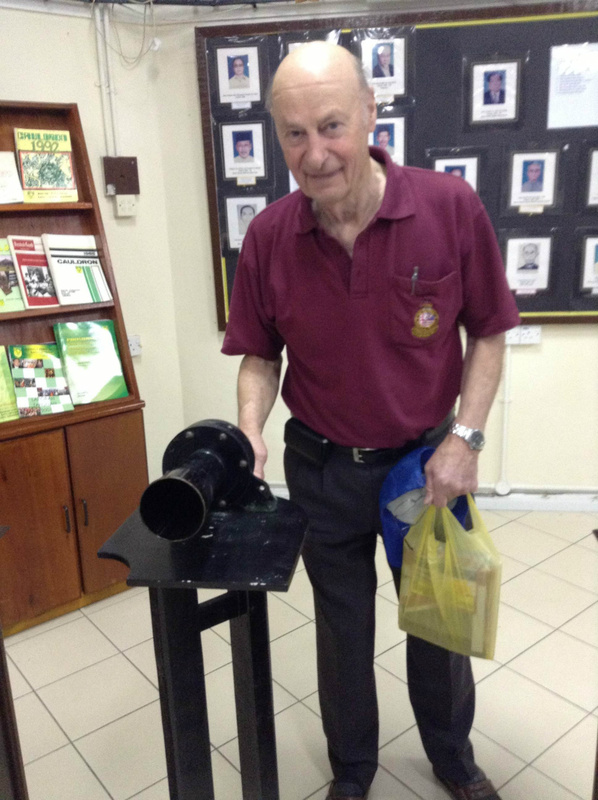 Having a turn of the Claxton Siren at the POW Museum. 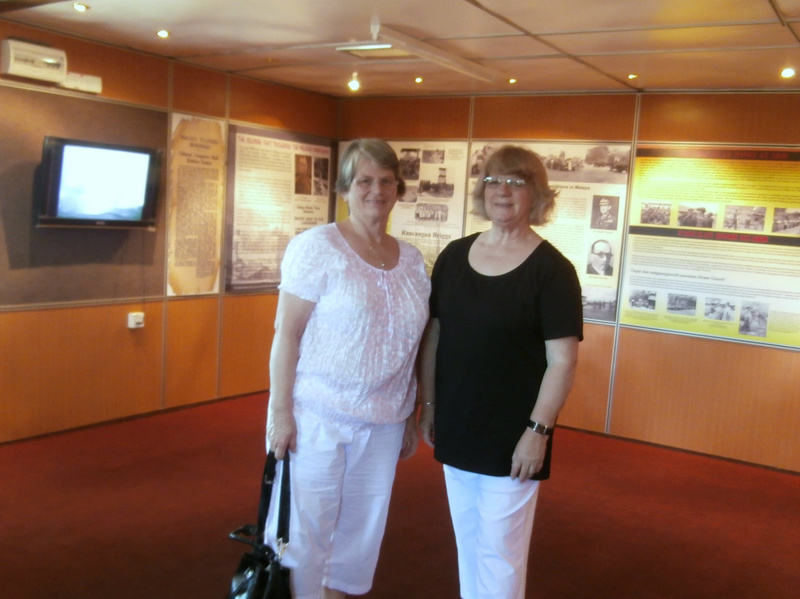 Monica & Margaret at the Sungei Siput Museum & Gallery, Perak. 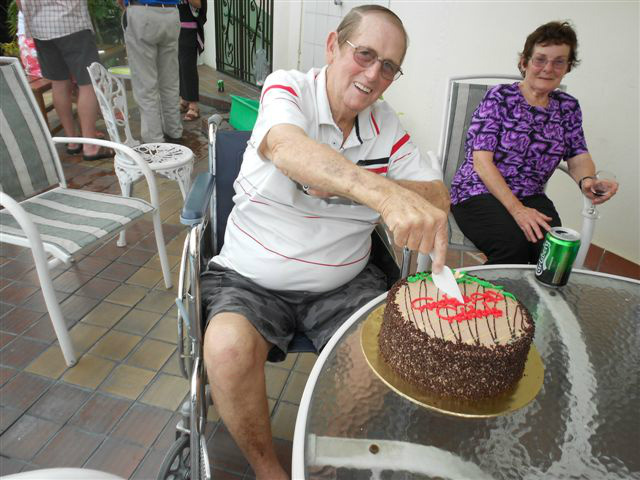 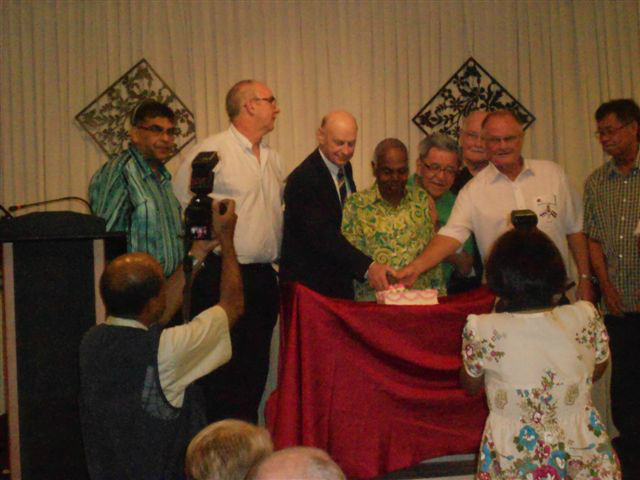 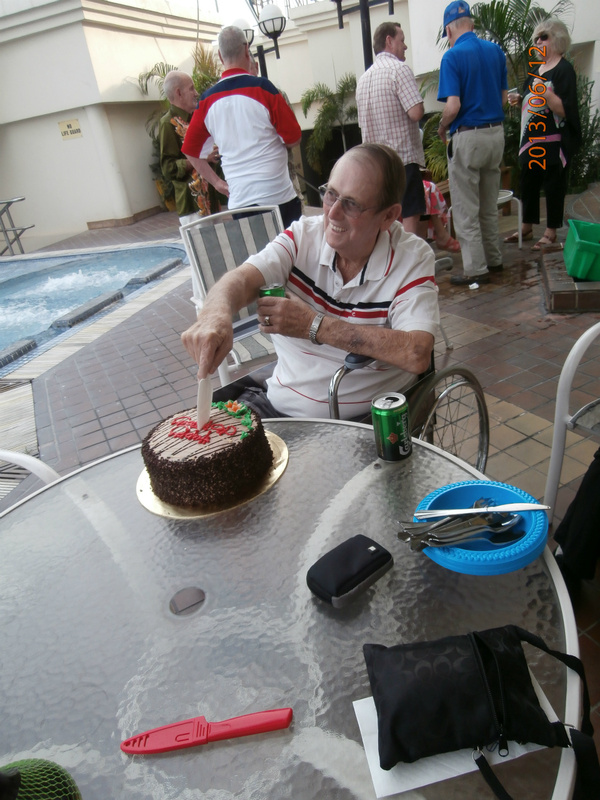 Darrell Fragall cutting his Birthday Cake.....This was a big day for him, ...he had just spent 24 hrs in the Ipoh Hospital with a gummy leg. 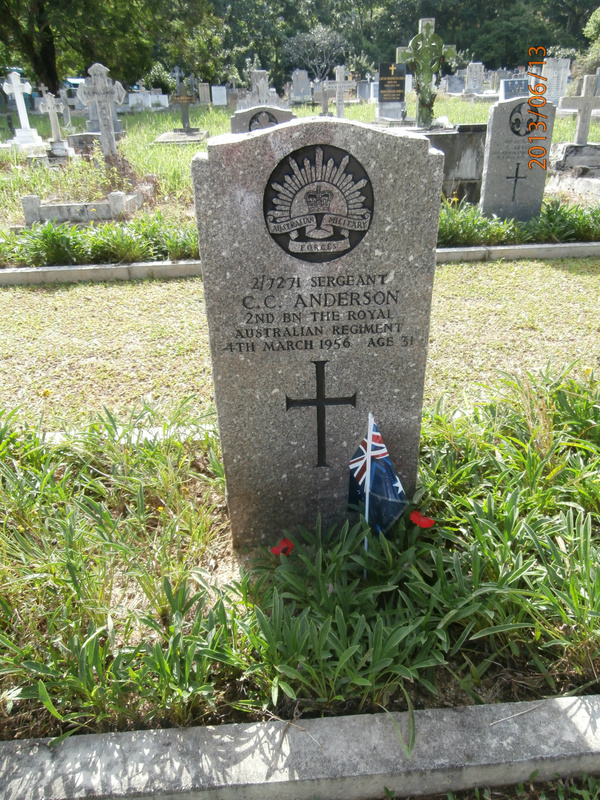 The gravesite of Sgt Charlie Anderson...he served in 3 wars. 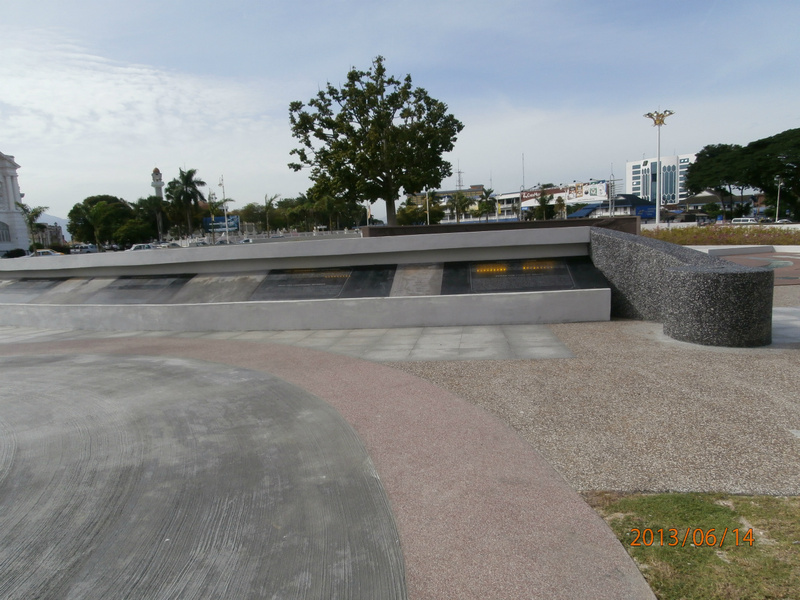 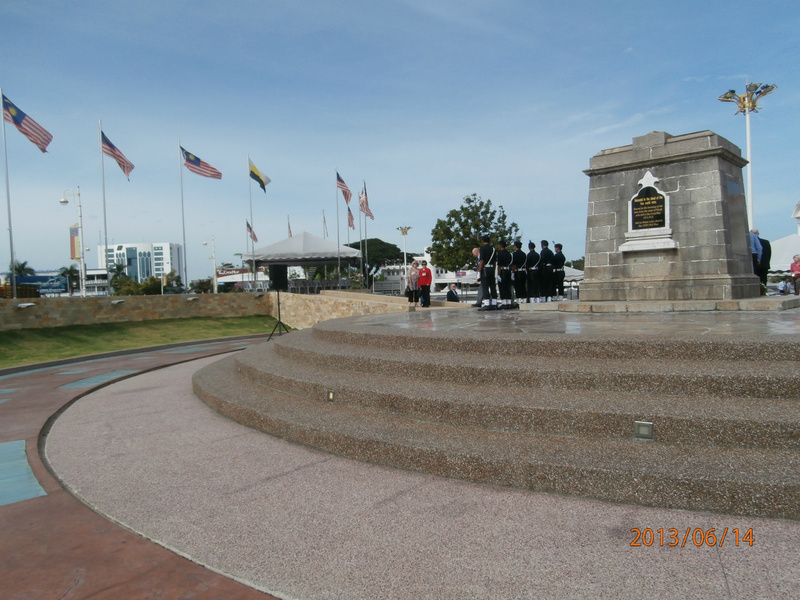 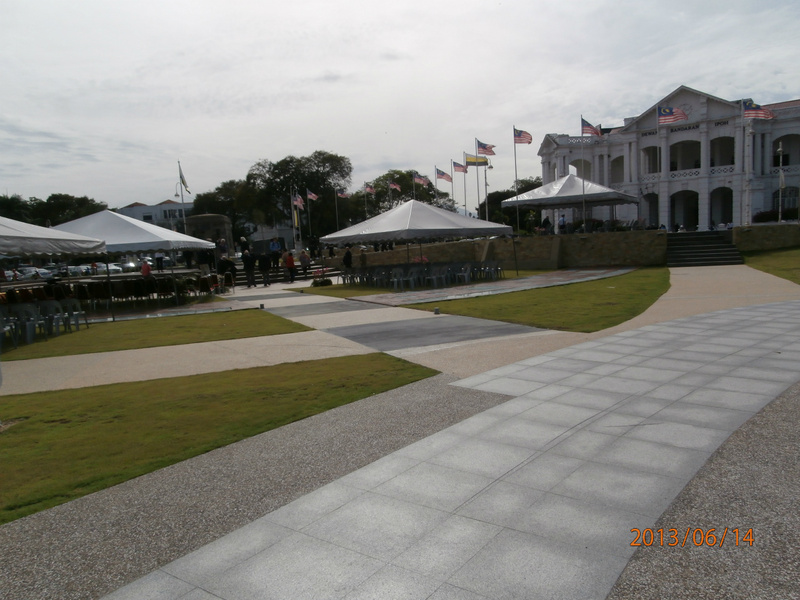 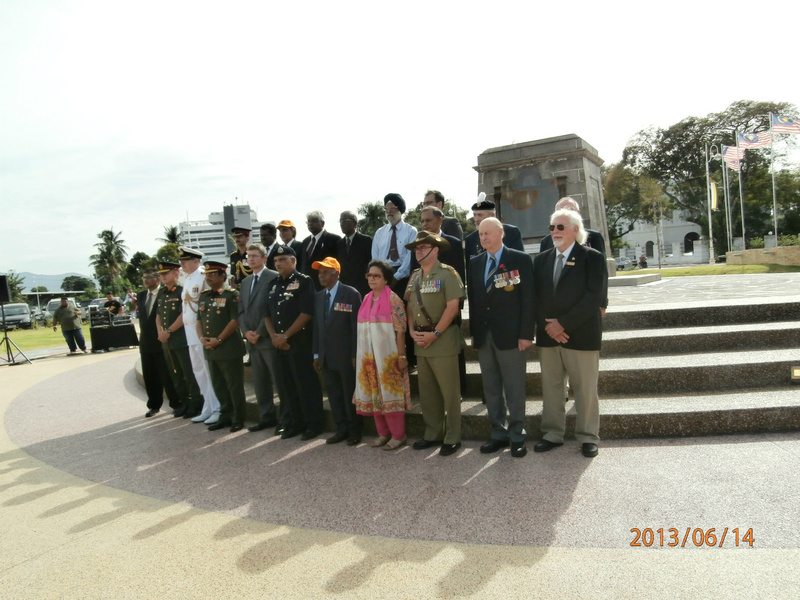 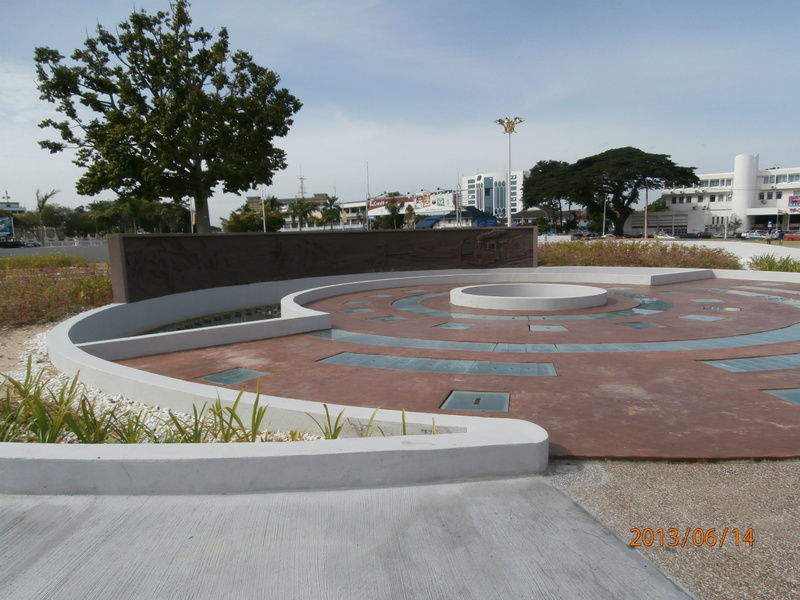 Ipoh Cenotaph 2013...the eternal flame area. 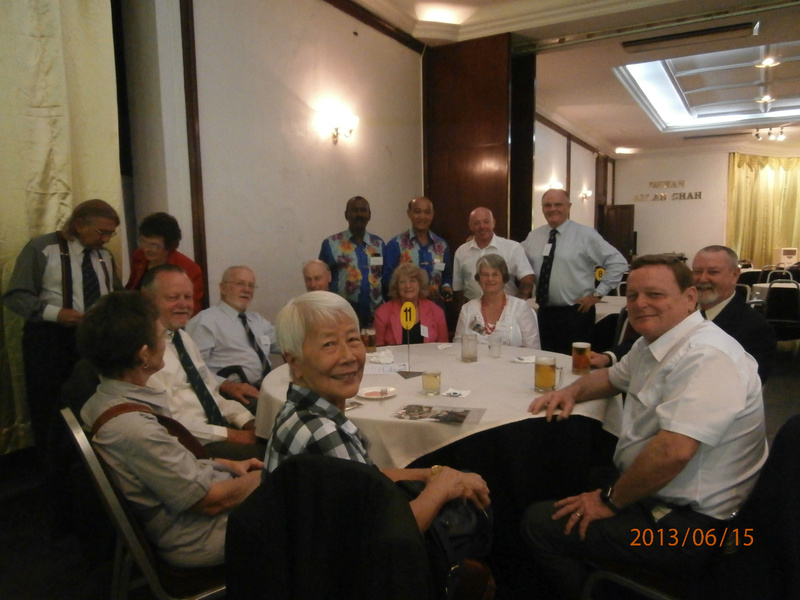 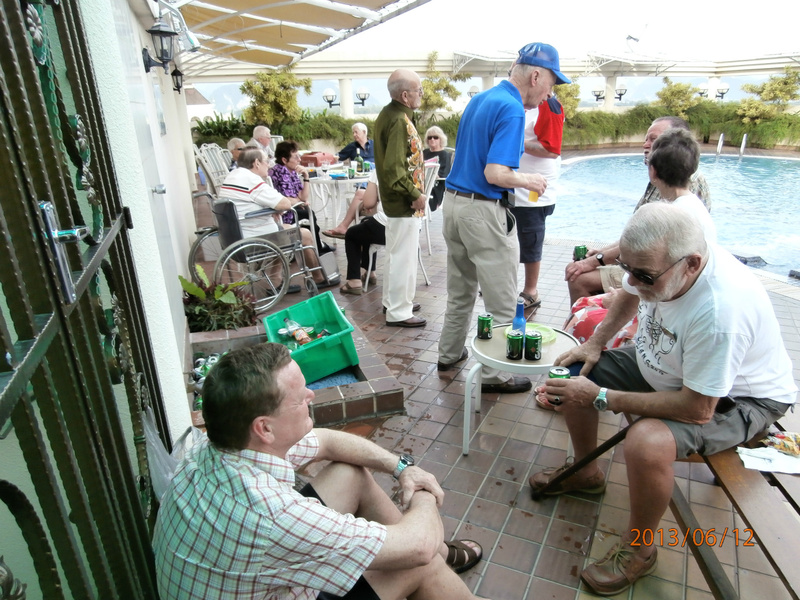 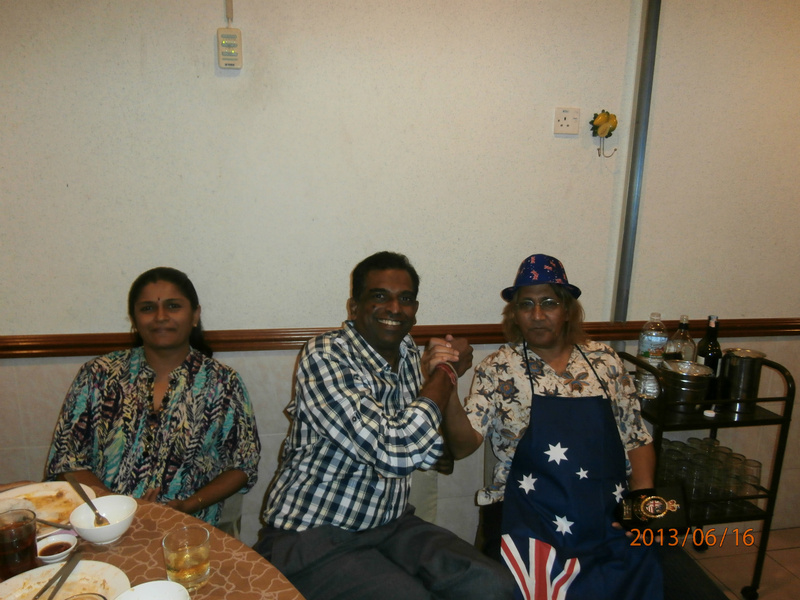 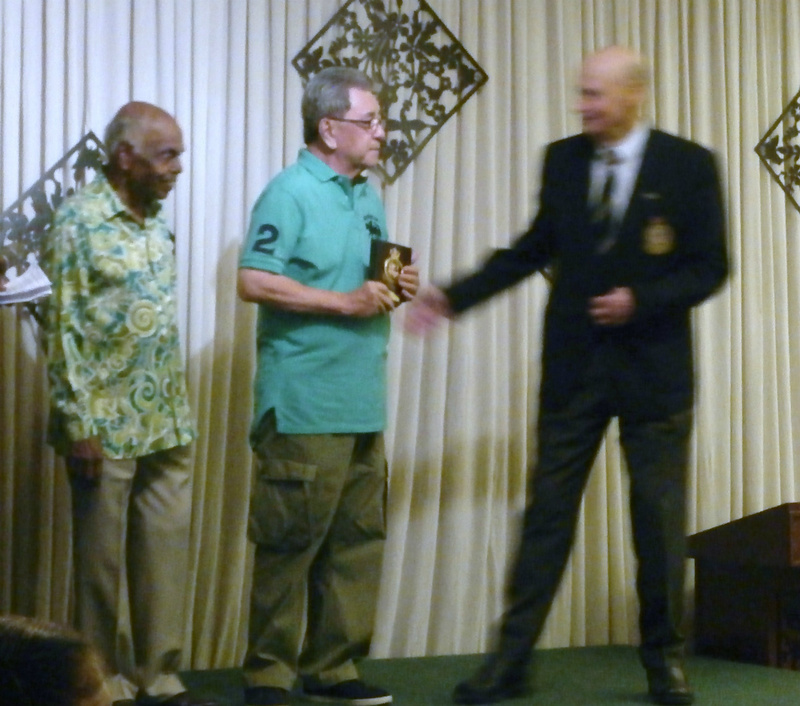 Troops Night 2013 L-R Pillay, Simon Chan, Ken McNeill. 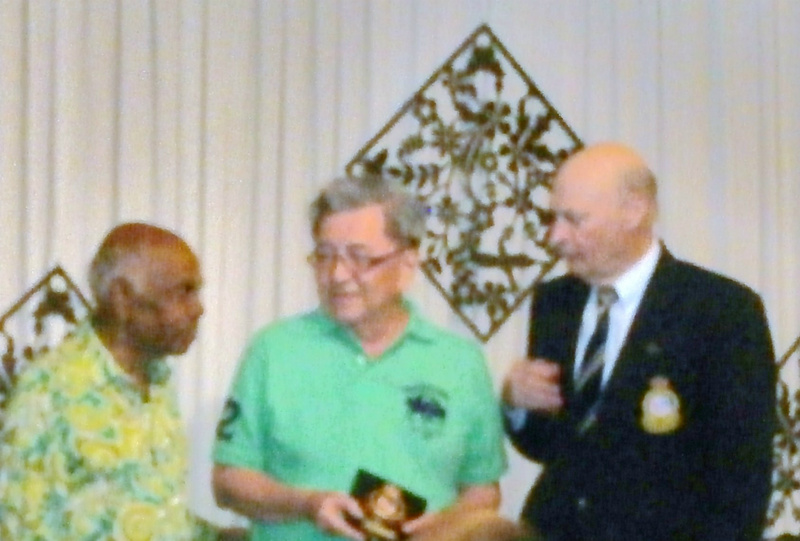 Simon is holding the NMBVAA plaque just presented by Ken. 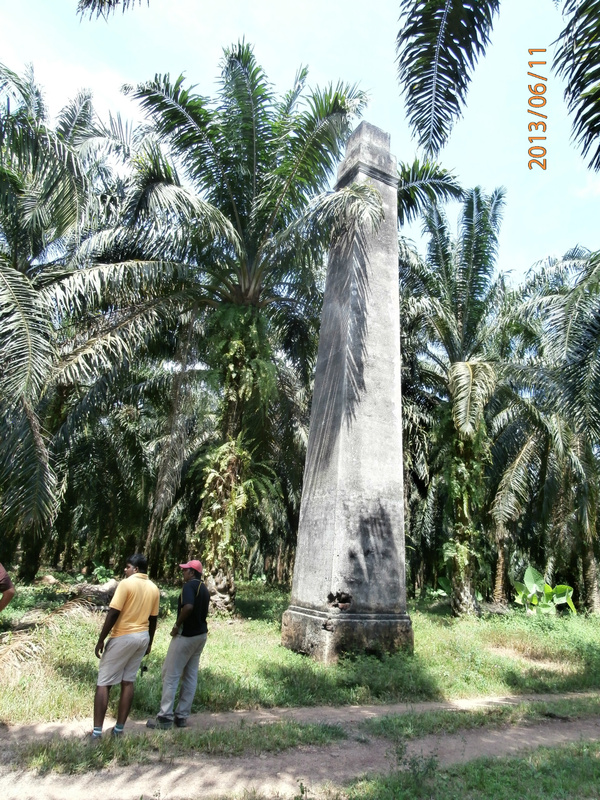 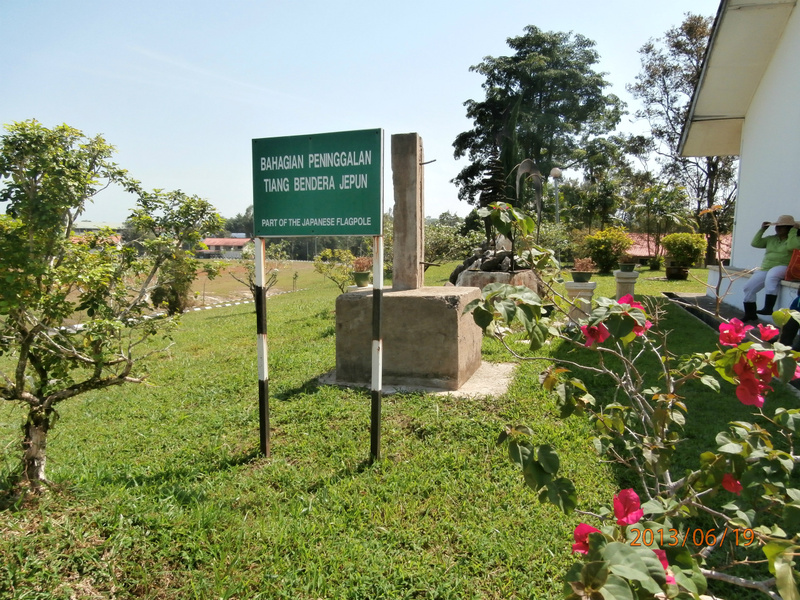 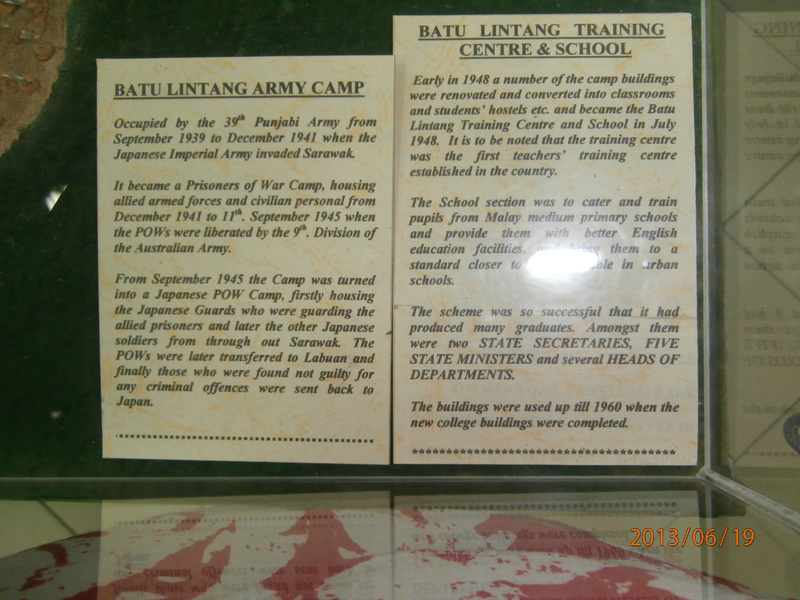 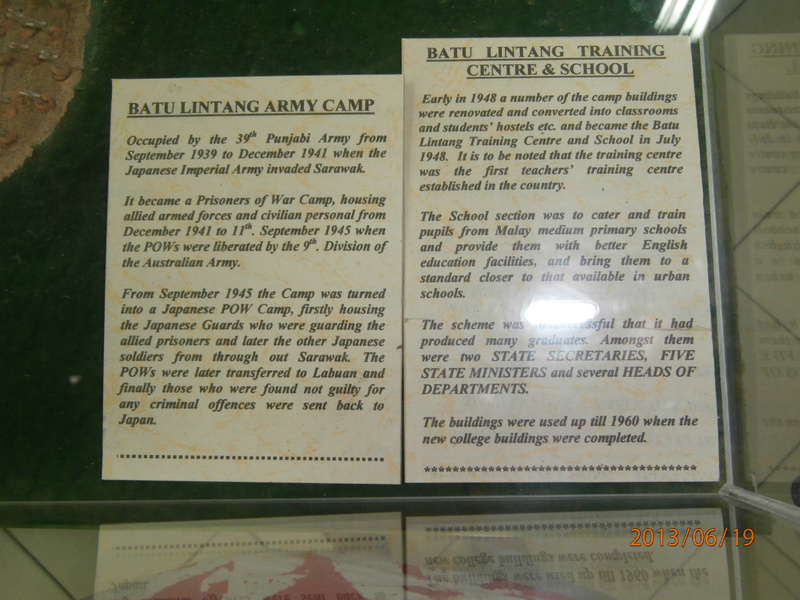 The only relic of the Batu Lintang POW Camp still standing. 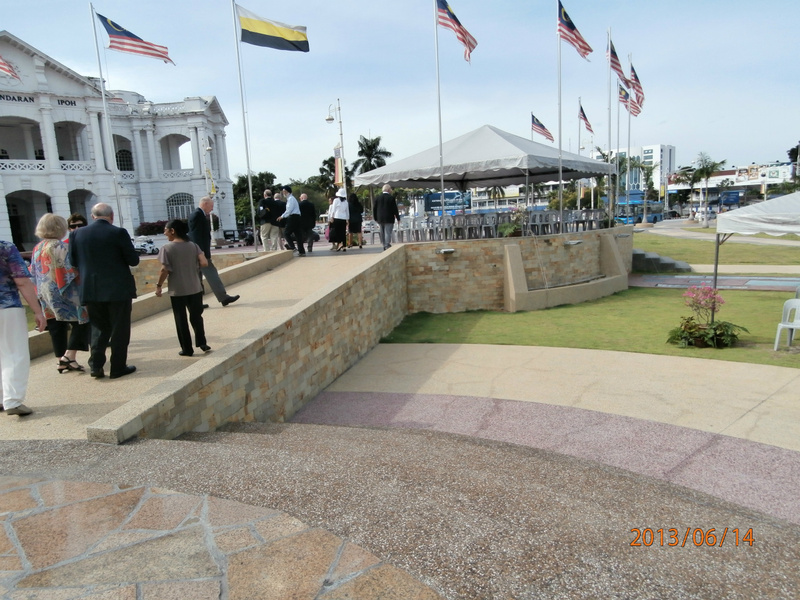 Japanese Flag Pole support...much bigger than imagined. 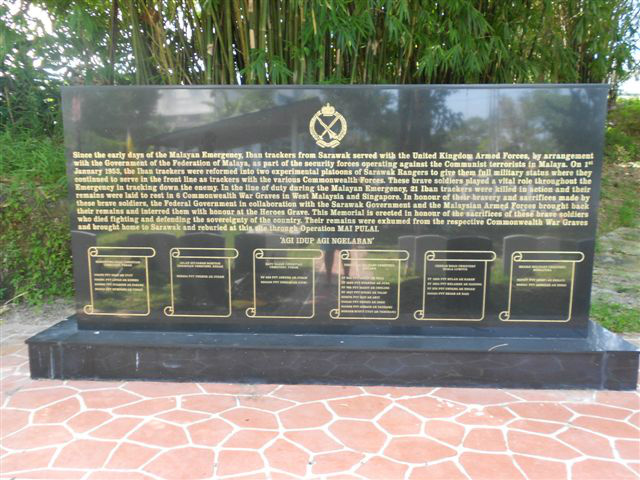 This is the original spot were Bruce Roxton put his memorial plaque. 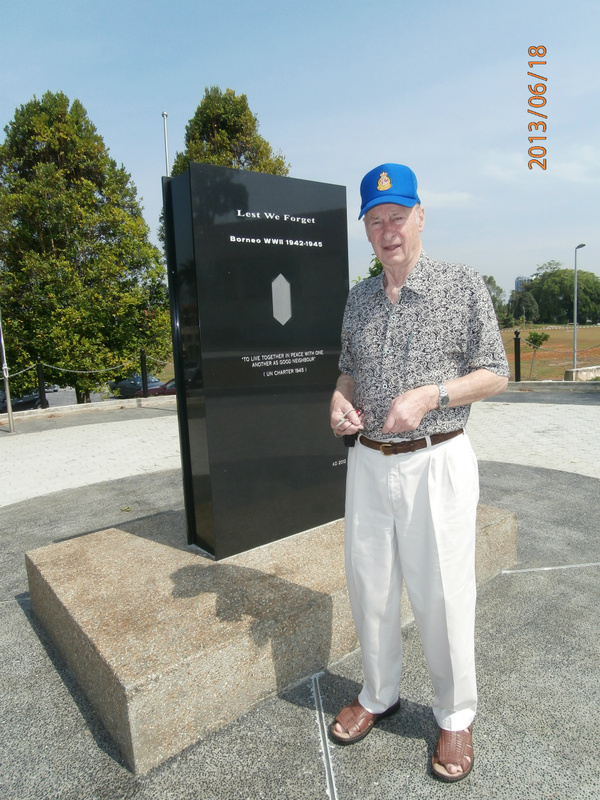 Ken McNeill at the Batu Lintang Memorial 2013. 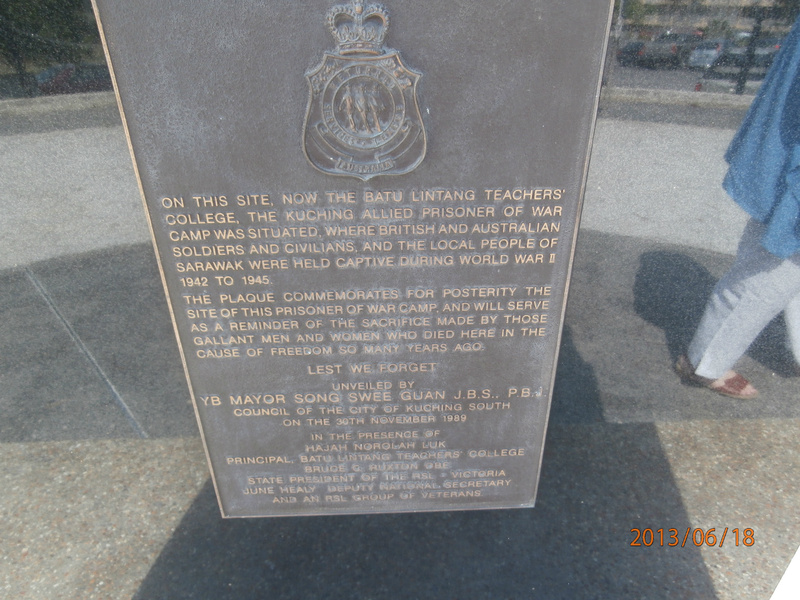 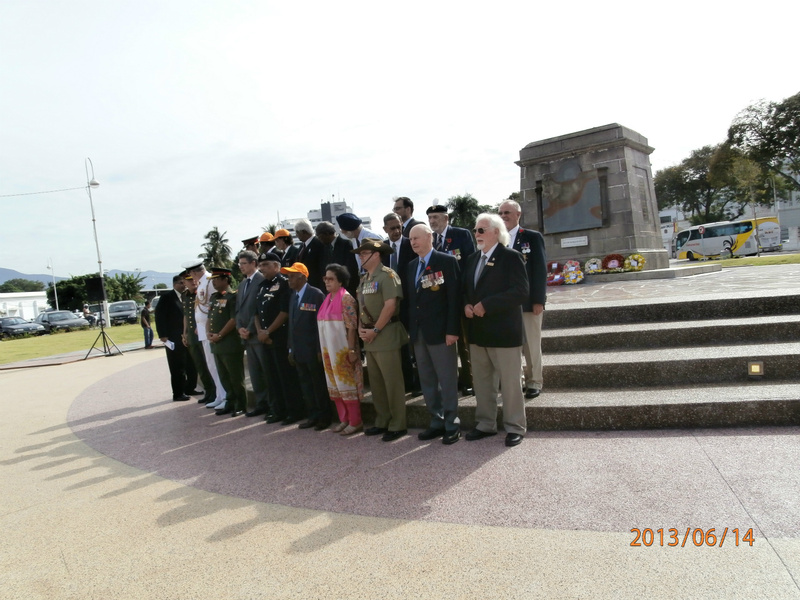 This replaces a memorial placed nearby many years ago by Victorian RSL President, Bruce Ruxton. 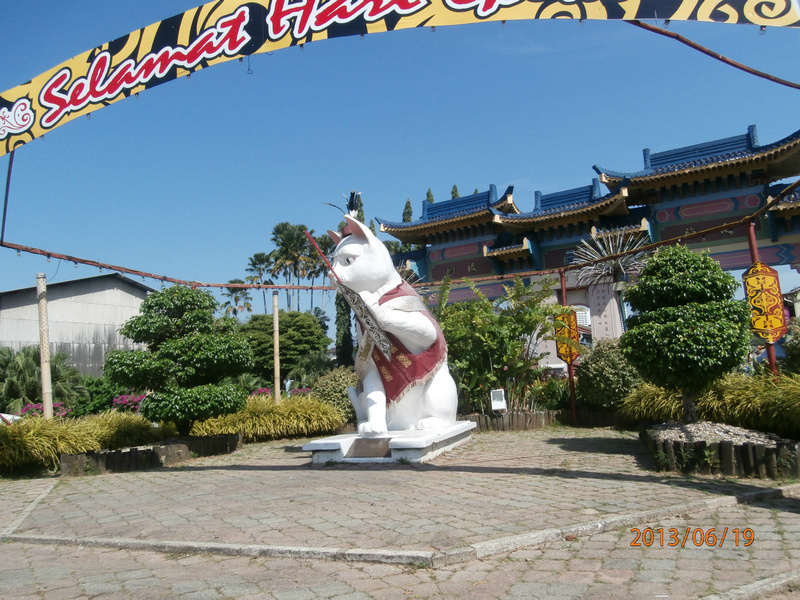 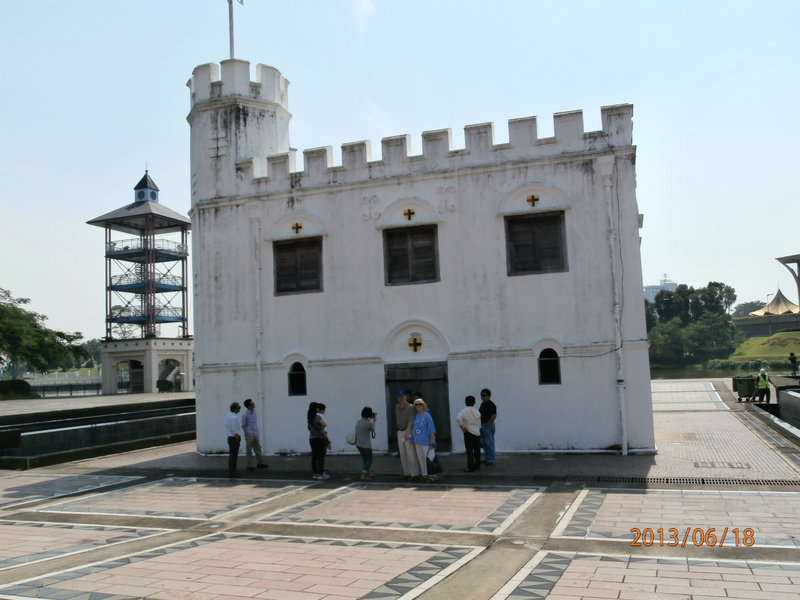 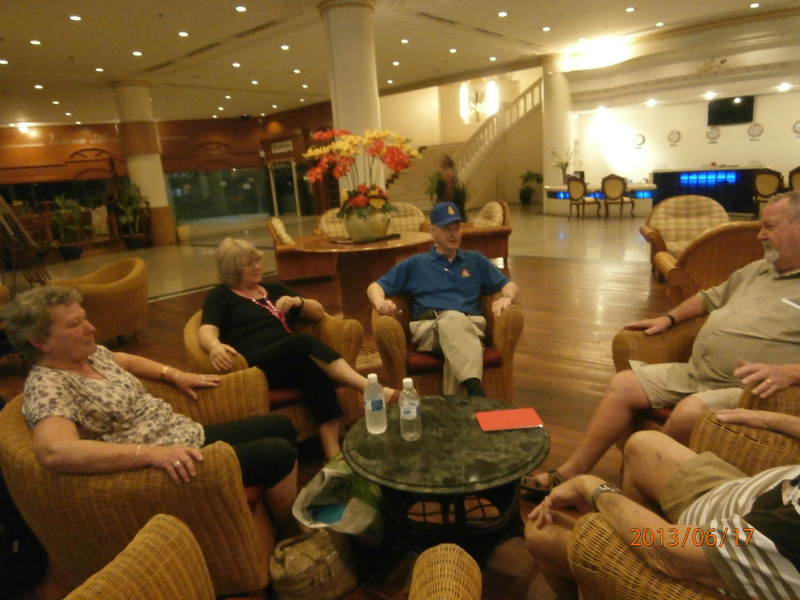 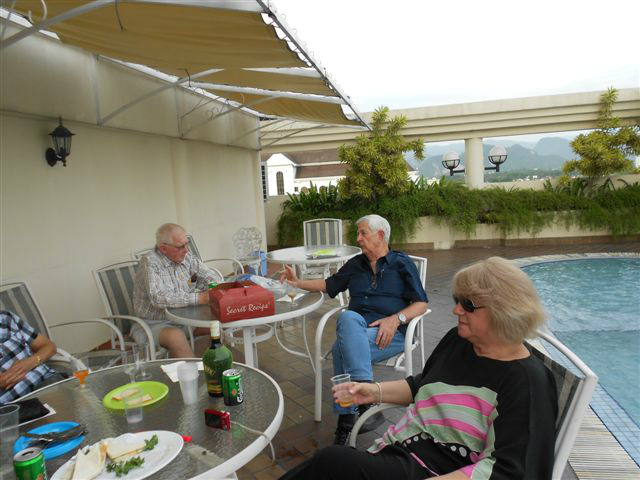 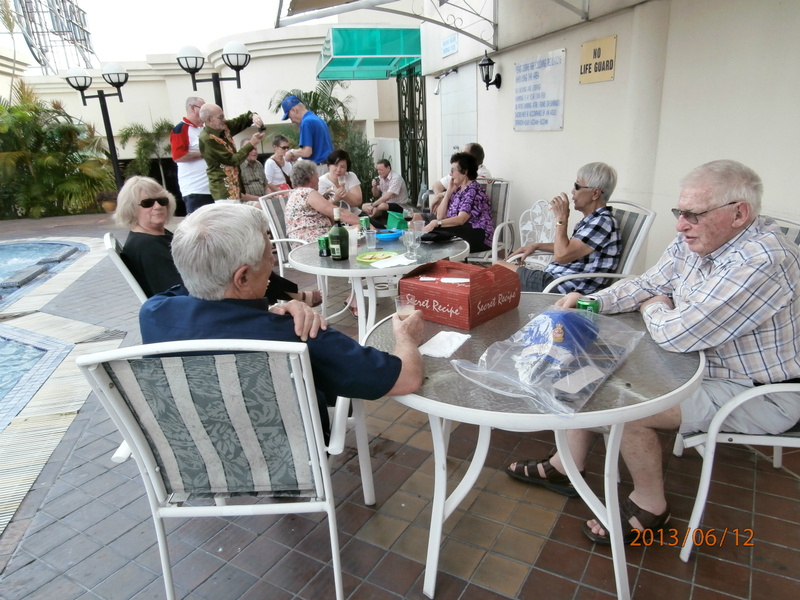 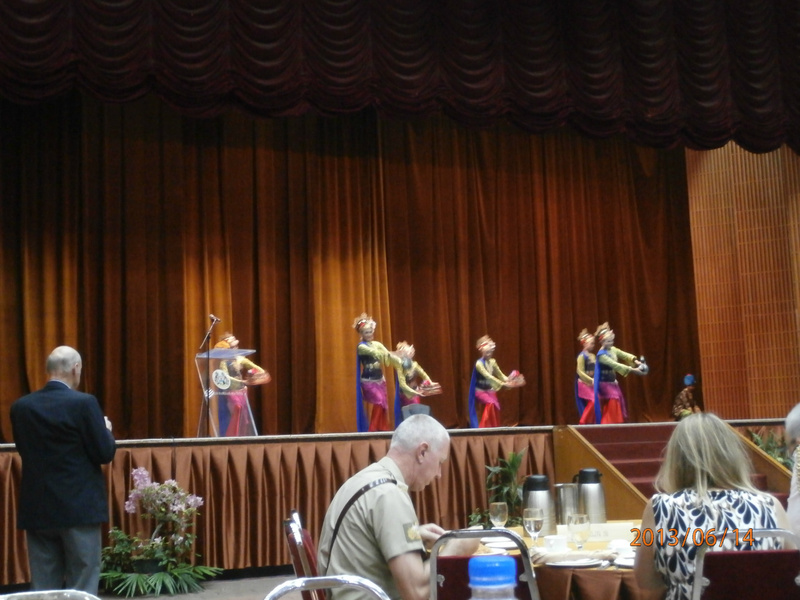 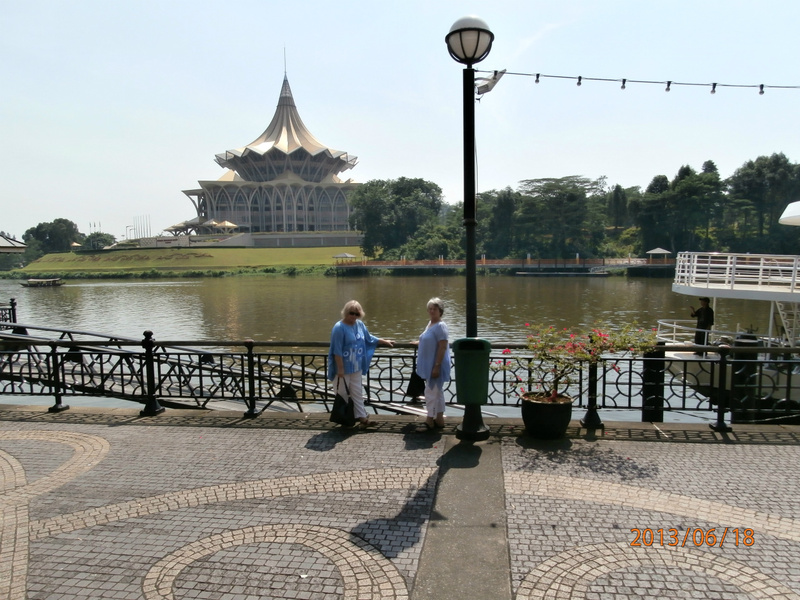 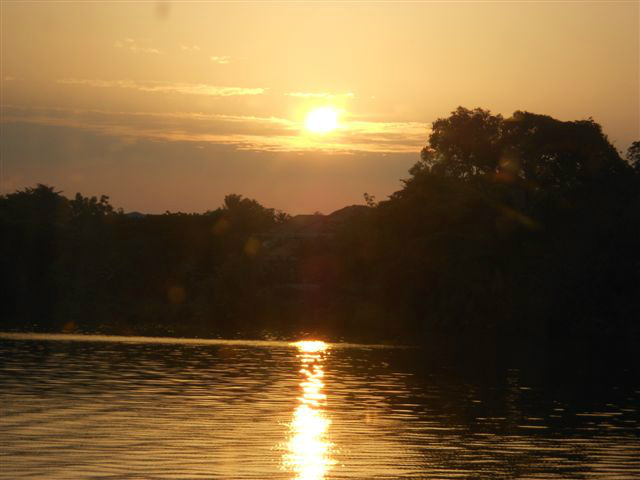 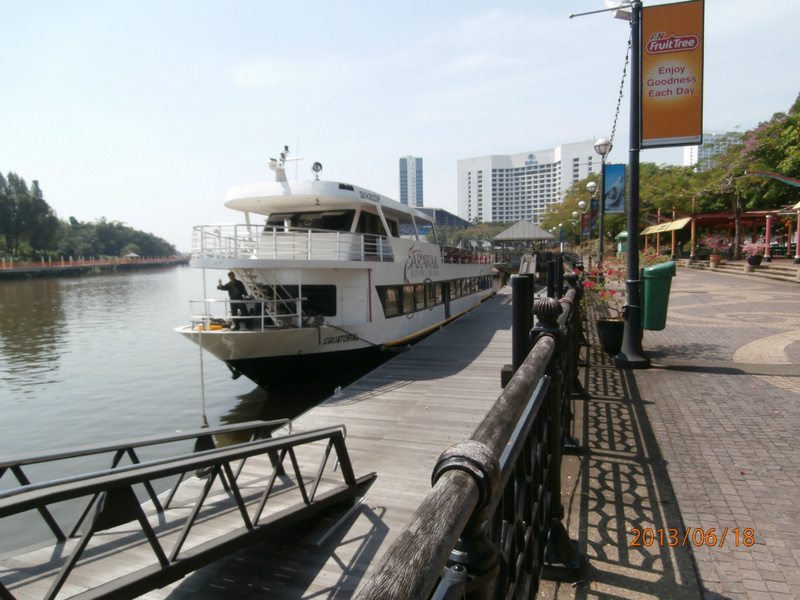 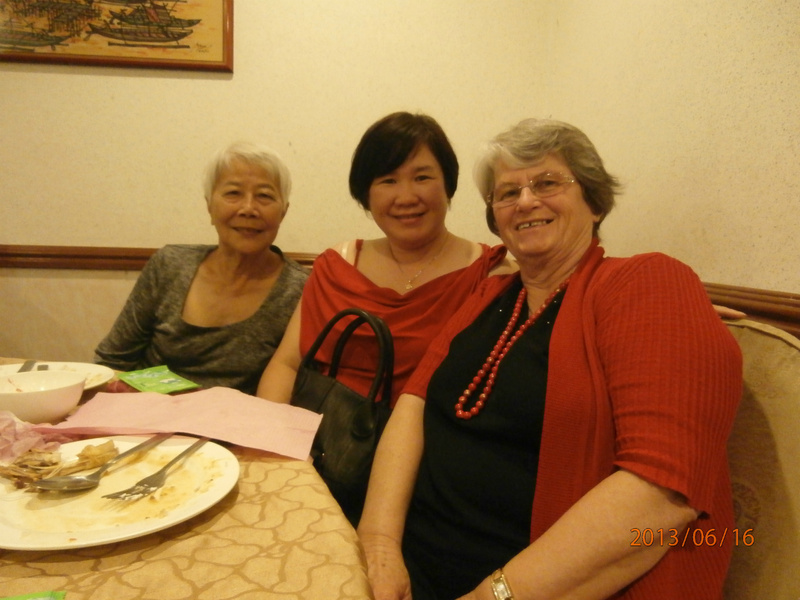 AND THE EXCURSION TO KUCHING, SARAWAK.